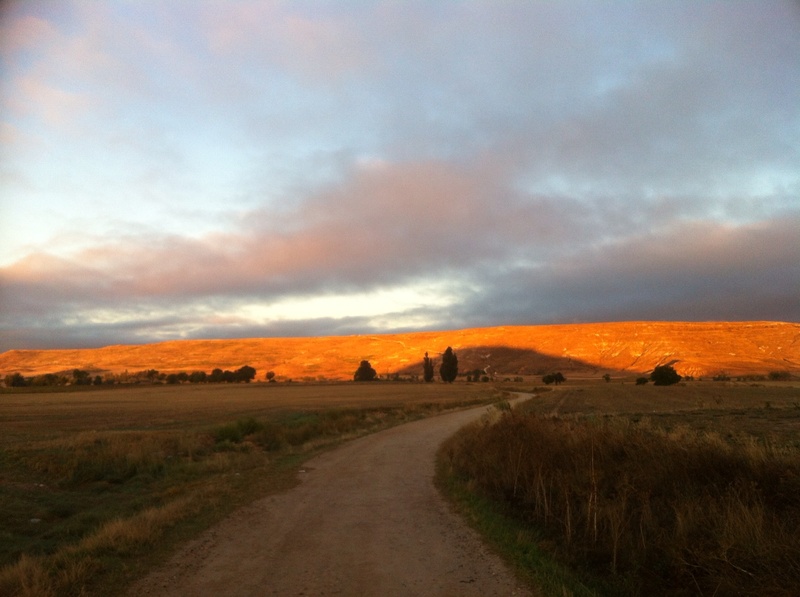 A decent nights sleep restores good humour like nothing else and Pam and I are feeling energised and happy with ourselves, each other and the world as we make our way through Castrojeriz in the cool early morning air. We are not late, we are not early, we are right on time to see the setting full moon run ahead of us with the sun rising at our back. 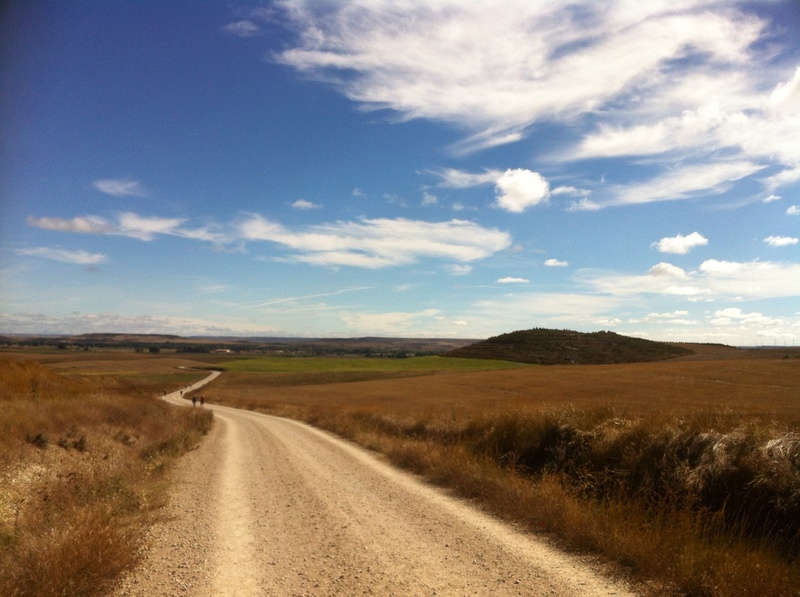 The Way leads out of Castrojeriz following the, by now expected, white gravel road heading towards the Alto de Mostelares, the highest point of the Camino on the Meseta. The sun rising behind our backs sprays the hill ahead in golden sun rays as the full moon is swallowed by dark clouds swirling above. 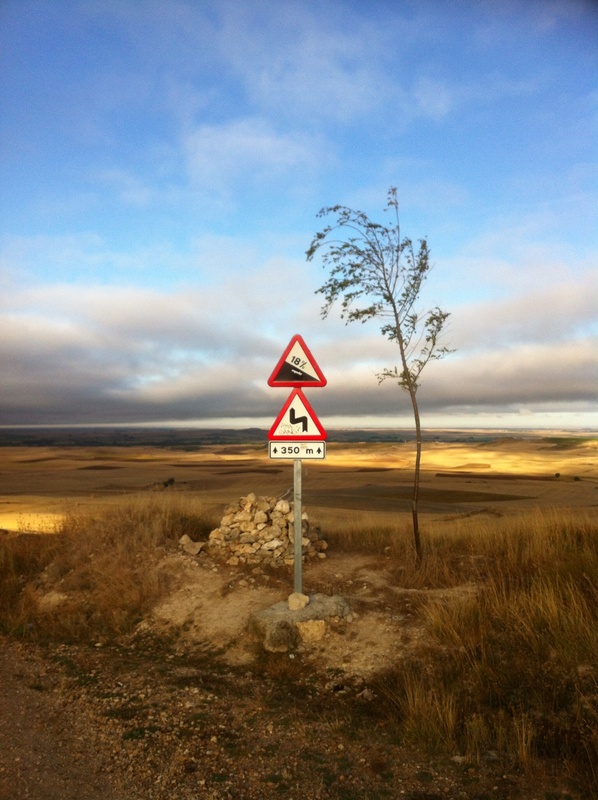 Beautiful daunting climb ahead, I don’t think they make road signs saying such words. The moon pops out of the clouds briefly as it sets behind the hill, we are not quick enough to catch it with the camera however the sight is indelibly burned in my mind’s eye. We cross a sturdy wooden bridge crossing the Rio Odrilla and make our way beginning of the rise itself where we see a road sign stating 12% gradient. ‘Onwards and ever upwards’ we begin to climb steadily. We pause a few short times to regain our breath however make the top quickly and easily. ‘What was all the fuss about’ we ask each other at the top as we take photos of the surrounds. A few hundred meters of plateau later we come across another road sign stating 18% gradient for the way down. ‘Down already?’, we rechristen the Alto de Mostelares ‘Futility Hill’ and make our way down the concreted steep side. The Way stretches out ahead of us on white gravel to the horizon. Small flies swirl around our head and occasionally I vacuum one in on inhalation. ‘Urrrgg, I am back at Uluru’ I think as our loping pace eats kilometer after kilometer. We stop for a short while at a roadside vendor selling coffee from a flask and fruit. He has set up at a rest area where a few simple concrete seats and tables constructed under trees enable passing pilgrims some welcome shade and a chance to rest sans backpack. Pilgrims by now are losing what little decorum they may have set off with as ably demonstrated by the young male peeing not far away. We follow bitumen roads for a short while then turn left and cross the Rio Pisuerga via a one lane stone bridge where the rural traffic (mostly tractors) cross guided by modern traffic lights. 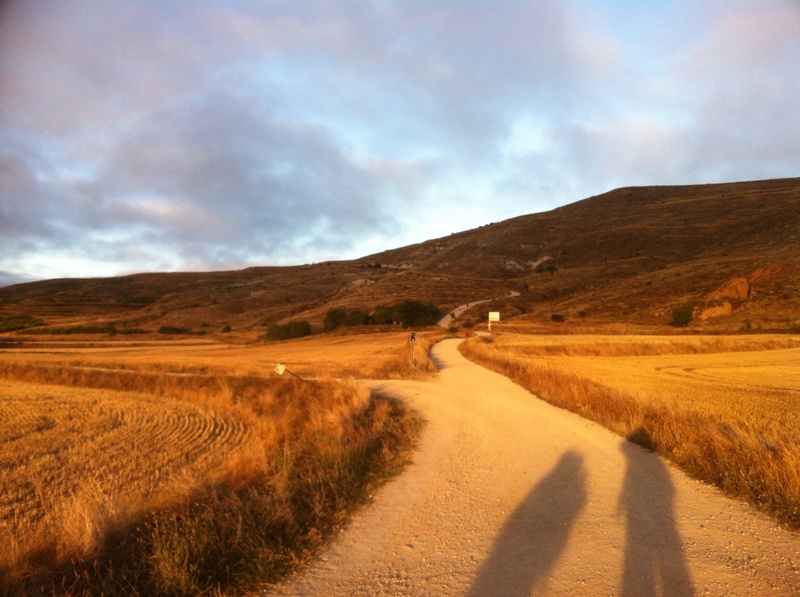 The Way turns right and follows the river flats to the village Itero de la Vega where a bar/cafe is busy serving tired pilgrims. We chat for a while with Bob and Cherry, an American couple we first met on the climb in the clouds to San Juan de Ortega. Bob and Cherry are very fit, in their early sixties and always look to be comfortable each time they stride by us. I am envious of Bob who has long legs and is lean as a rail. He seems to walk half as fast again as I can while only taking half as many steps. 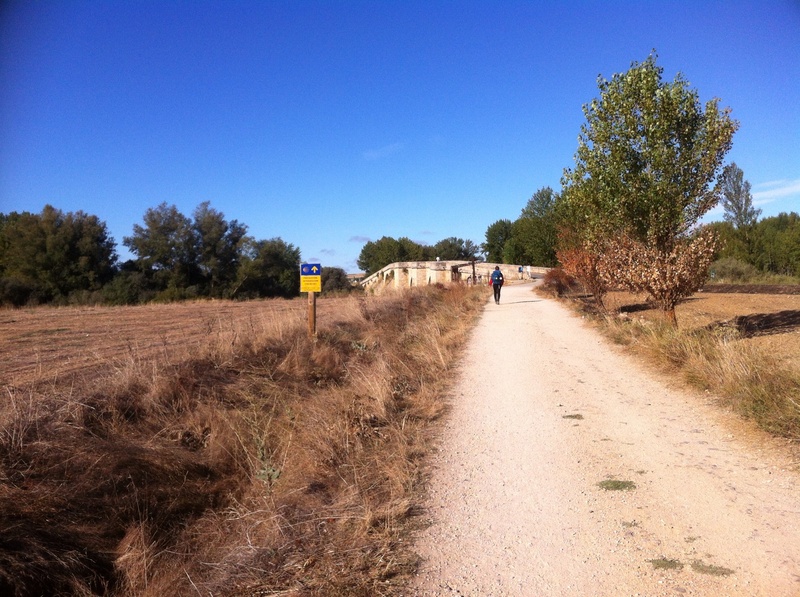 The Way between Itero de la Vega and the next village Boadilla del Camino is long and straight. To our left as the road begins to gently rise is a deserted village full of houses in various states of decomposition, smashed windows and collapsing roofs. We pass fields under irrigation which give way to the golden stubble as we rise and rise. 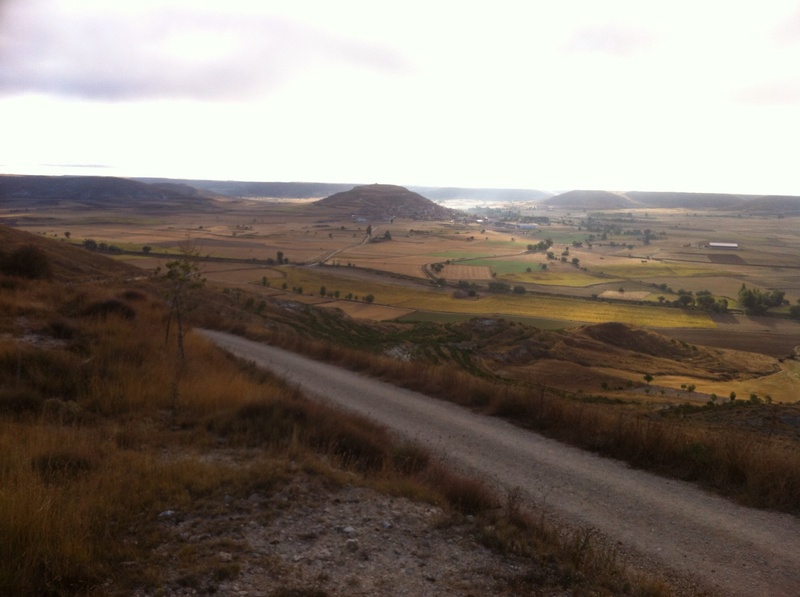 The hill we climb has a crest with no plateau this time and from the top we take shots of the Way behind and in front as it leads towards Boadilla del Camino in the distance. 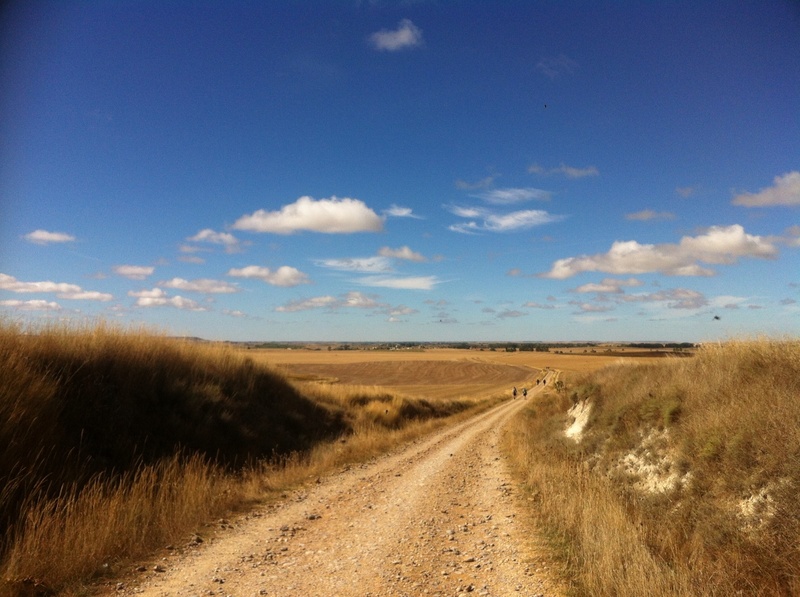 The road is rough with stones embedded and jutting from the limestone dust and by the time we stop to rest at Boadilla del Camino my left knee is feeling sore. 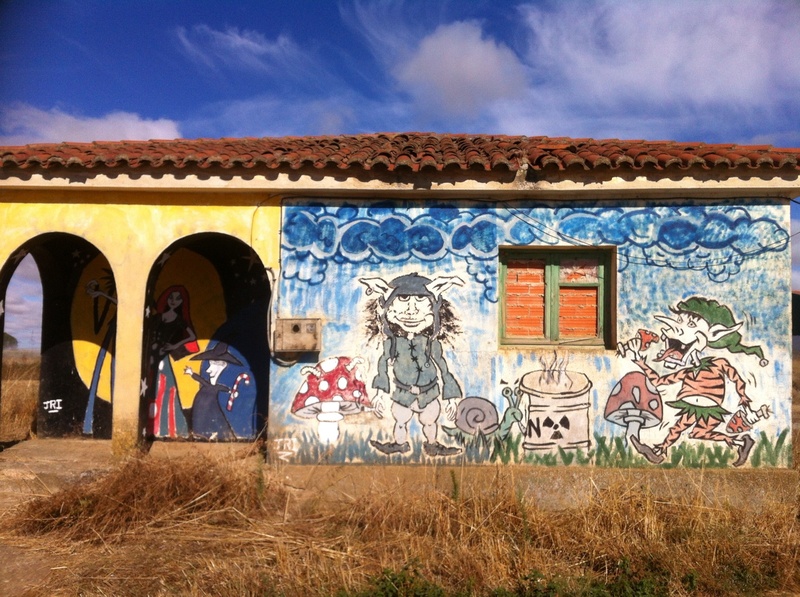 We chat to a couple of British gentlemen for a while in a bar at Boadilla. 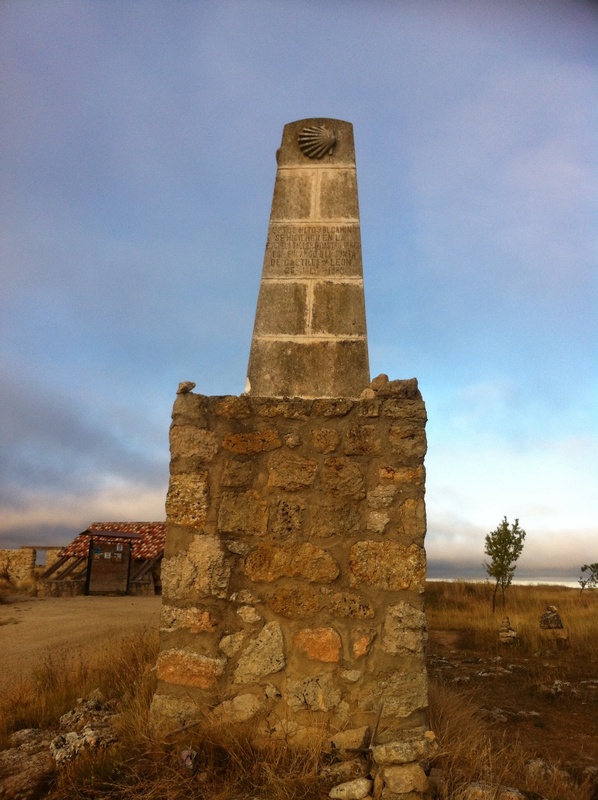 This is their third Camino journey and the first one they have walked via the Camino Frances. One of them has been severely bitten by bedbugs in one of the Albergues and shows us rows and rows of savage bites covering his arms and head and neck. The bites must have numbered hundreds in total and Pam is shuddering in fear by the time we leave as she suffers allergic reactions to insect bites and would probably have to be hospitalised for anaphylactic shock if bitten so badly so many times. My left knee is stiff and sore as we make our way out of Boadilla following Bob and Cherry who have caught and passed us again as we rested. 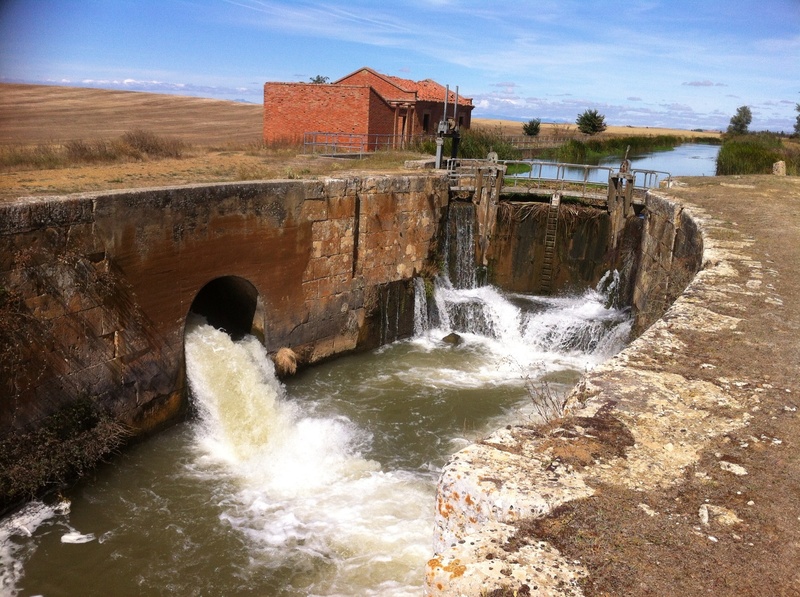 We have not seen any yellow Camino arrows for a while when we come to the Canal de Castilla, a large irrigation canal heading towards Fromista. Bob and Cherry turn right heading towards a control weir bridging the canal. On the far side there is a disconsolate pilgrim sitting by himself on a bench. As we come up to the weir he crosses back to the side we are on, points back in the direction we had just come and sets off down the road. ‘A lonely pilgrim is a lost pilgrim’ I think as Bob and Cherry cast about looking for yellow arrows. The consensus is that we have lost the Way however keeping the canal on our right and following its bank should bring us to Fromista. Bob and Cherry set off ahead of us and have soon left us in their dust. My left knee is quite painful by now and I am starting to hobble. We follow the canal along a gravel track where the centre grass is still growing, there are no boot prints in dust crushed by bicycle wheels, this is obviously a way less travelled. Finally we come to the hypotenuse of the triangle we have walked the long sides of and see other pilgrims ahead of us again. We have added at least two or three kilometers to the twenty six we knew we had to walk today. I am having trouble keeping up with Pam and each second step is painful. We decide we will sing songs to lift our spirits and lighten our steps however we can’t think of any songs we both know all the lyrics all the way through. We start to sing song fragments of modern songs, Pam makes it all the way through Crooked Teeth by Death Cab for Cutie. We go back to 70’s classics and make it through three verses and four choruses of American Pie. I sing half of Yellow Submarine, we are getting desperate in the 60’s now. We determine that we have to learn some slow to medium 4/4 songs all the way through for future needs, post your suggestions in the comments please. Singing marching songs is an ancient practice for good reason, the road passes by faster, pain diminishes and thoughts of arrival are pushed from the mind by the steady beat and breath of the song. We soon find ourselves at the bridge crossing another weir at Fromista and spy Bob and Cherry looking fresh as usual under the shade of some trees. We trade a few jokes about the nature of humans, sheep and lemmings and make our way into town at last. After showing and resting for a while I go to stand up so we can make our way into town. Knives cut my left knee from under me, this is not good. 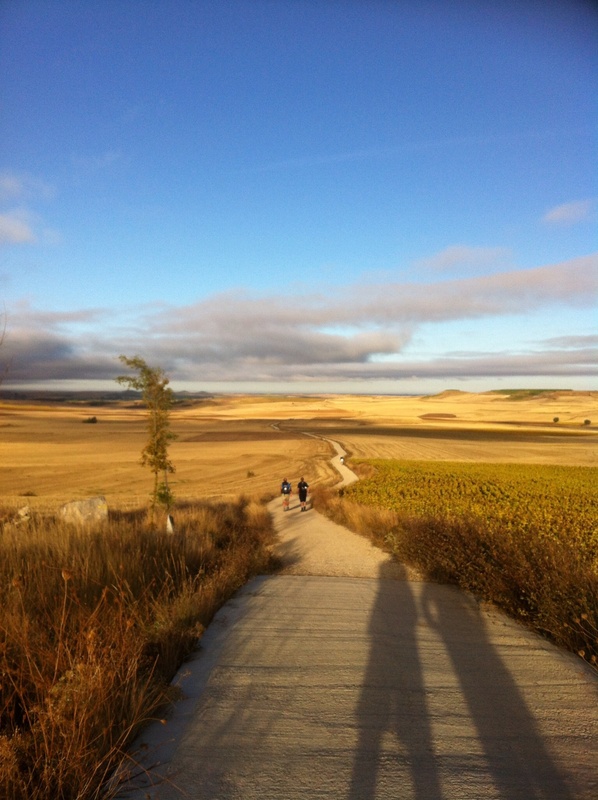 The medicinal cervesas and sangrias and red wine we share with Bob and Cherry loosen our tongues but not my knee joint and by the time we return to the hotel for the night Pam and I have agreed to have yet another rest day if my knee is still bad in the morning. Miss you too, say hi to everyone for me. The only Katy Perry song I know is ‘ I kissed a girl and I liked it’ I think that might work! I’ll let you two decide who will play the mother superior! Haha, glad you liked the list! Miss my voice of reason! Going well here though, I’m loving the blog I’m addicted!